Just over a year ago, we qualified as teachers of the sympto-thermal method of Natural Family Planning. 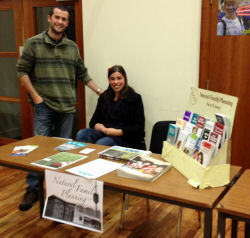 Over the past year, we have taught the method to couples from throughout the Nottingham area, and we had a table at the Ministry weekend in September where we enjoyed chatting to parishioners. The purpose of the Natural Family Planning course, which runs over three sessions, is to teach couples fertility awareness. This includes how to understand and interpret the cycle of fertility, and how to identify the cyclical monthly periods of fertility and infertility. This knowledge can then be used to either try to achieve pregnancy, or to avoid pregnancy. Because NFP is about knowing and respecting your body, it has no negative side effects - and it actively supports health by keeping you close to what your body is telling you. There have been great advances in scientific knowledge over the last 30-40 years, which mean that we now have a much greater understanding of the gift of fertility. Where previously people had to rely on methods such as the calendar or rhythm method (which use information about previous cycles) to predict fertile and infertile times of the cycle, new methods such as the sympto-thermal method rely on the identification of signs of fertility which are occuring in the present cycle. This means that, when used to avoid pregnancy, the method has an effectiveness comparable or better to contraceptive methods but has the great advantage of being totally natural. We feel that it is a great shame that, in most cases, a basic awareness and appreciation of fertility is not promoted to all. Instead, fertility is treated as something to be suppressed and hidden. In 2013 our hope is to increase awareness of the existence of modern methods of Natural Family Planning, their effectiveness in helping both couples who are trying for a child and as those who wish to avoid pregnancy, as well as their usefulness for those who are preparing for marriage.